Every semester as UGA students we pay around $1,135 for fees and most of the times we have no idea what we are paying for. This fee is dedicated to student programing and operational expenses associated with programs and services that enhance all aspects of student life at UGA. Some of the organizations that benefit from the fee are: University Union, Hispanic Student Association, ServeUGA and many more. This fee subsidizes the cost of a ticket to sporting event for students (football games, basketball games..). Also supports the maintenance of facilities that are regularly available to all students (Spec Town Track and Stageman Coliseum. The Connect UGA fee supports the tracking and management of student outcomes through the support of the Student Academic and Informational System BANNER. The system we all check in once in a while to see our degree progress. Helps to fund UGA’s office of Sustainability that coordinates and reduces the University’s environmental impact. Also the money goes towards student research/ environmental education and initiatives. Supports operation of the University Health Center (UHC) including staff and benefits costs of the UHC. The Health Center also does research that contributes to health knowledge and skills. This fee goes towards recreational and wellness programming. Granted semester long access to Ramsey Student center. Also students are eligible to participate in programs such as competitive sports (flag football), fitness, wellness, outdoor recreation and aquatics. As the title says, this fee is special. It was initially established as a temporary fee in 2009 after the state reduced the University’s founding by 1.4 billion. The fee sometime cumulates but this semester was $450. 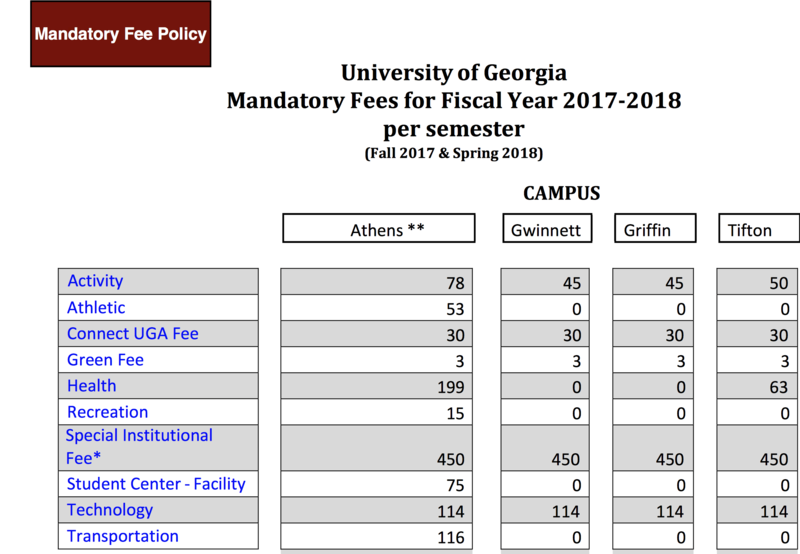 The Special fee is used to address the pressures on the teaching mission and to ensure high-quality source offering to meet graduation requirements of the University System of Georgia (USG) Board of Regents. There are no current plans to raise or lower the fee this year. The Special Institutional Fee represents approximately 2% of the University’s overall 1.7 billion annual operating budget in support of these activities. RamseyCenter/ Intramural Fields/ Tate Center. Supports UGA mission to a better educational, institutional and cultural experience of students through enhance technology/ services and computers. -Physical and virtual computer labs. Helps funding the unit of transportation and Parking Services. Including the Athens Clarke County Transit that UGA students have access with their student ID. For even more details about the fees click here.